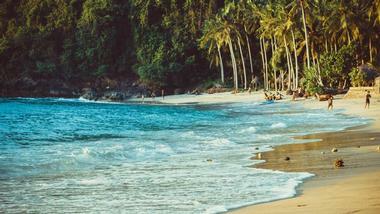 Bali is blessed with some of the most beautiful beaches in the world. Most of them are long and wide, lined by resorts and hotels and lush tropical vegetation. 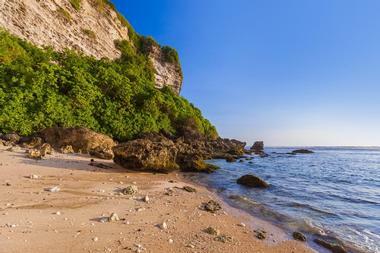 Some, like Balangan Beach, are hidden by almost vertical cliffs. 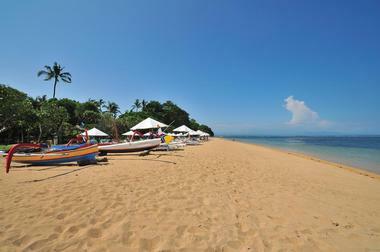 Beaches in resort towns like Seminiyak are bordered by beach clubs and fancy cafes. 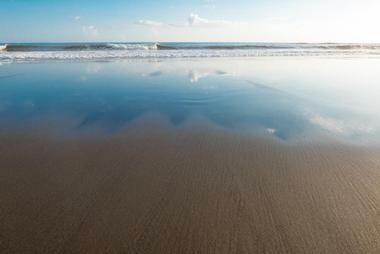 Remote beaches like Balian Beach or Blue Point Beach are a surfers’ heaven. 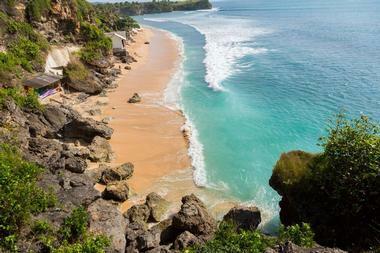 Balangan Beach is probably one of Bali’s most scenic and most popular beaches. A magnificent half-kilometer stretch of golden sand is edged by lush tropical vegetation, with almost vertical limestone cliffs in the background. The beach is known among surfers for one of the island’s longest left-hander breaks, which ensures that the beach is always full of surfers from all over the world. This beach is one of several famous surfing beaches on the south-west coast of Bukit coastline. The closest is Dreamland, separated from Balangan beach a small headland, which is also the location of the famous signature Hole 15 of the New Kuta Golf Course. Balian Beach is a remote beach on Bali’s west coast, about 40 km northwest from Tanah Lot Temple or about a two-hour drive from Kuta. The remote location, the long stretch of unusual black sand, and massive swells make this beach very attractive to surfers. The small town of Balian offers cheap and diverse accommodations that bring backpackers in droves, whether they are surfers or not. Non-surfers can enjoy long walks along the beach and magnificent sunsets, but the waves are a bit too strong for swimming. In addition, there are sharks around the mouth of Balian River. Blue Point Beach is a beautiful white sandy beach surrounded by massive almost vertical rocks, about 45 minute drive from Kuta. The beach is known as a surfing paradise with waves so large and so noisy that they make silence around the beach impossible. On any sunny days the water is full of surfers riding the waves. The beach is suitable for both experienced surfers and beginners. Because of the surrounding cliffs, to get to the beach visitors have to pass through a narrow gap between the cliffs called “mesulub,” giving the beach its name – the beach is better known among the locals as Suluban Beach. After passing through the gap, there are steep stairs that lead to the beach. Near the end of the stairs is a fascinating cave that gets filled with water on high tide. When dry, the cave provides a nice shady spot to hide from the relentless sun. Crystal Bay is a secluded cove with a 200-metre long stretch of dark sand located on the west coast of Nusa Penida Island. While fairly isolated, the bay is easily accessible through a network of well-developed roads. The beautiful beach is fringed by stately palms. The bay is known as one of the most famous snorkeling and diving sites on the island. Divers love the incredible visibility of up to 30 meters. The crystal clear waters are swimmable near the shore when the tides are calmer. There are a few local traditional food stalls right on the sand, and a few people rent out sunbeds with parasols for shade. Not far from the bay is the Coco Resort Penida, one of the few resorts on the western coast of the island. 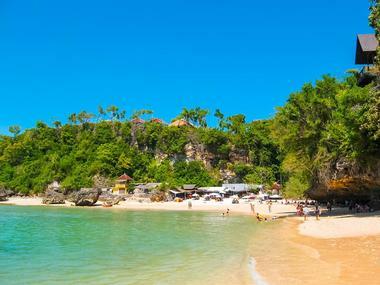 Dreamland Beach is one the chain of Bali’s “hidden” beaches on the rugged coastline of the Bukit Peninsula. It is a beautiful, long stretch of fine sand surrounded by massive limestone cliffs. The beach became much more accessible after the Pecatu Graha and Pecatu Indah Resorts were completed, transforming acres of hilly terrain into the “New Kuta.” In spite of the development, Dreamland Beach retained much of its charm, attracting droves of day-trippers, beachgoers, and surfers. It is a good surfing beach, with some of the best reef breaks close to the shore. 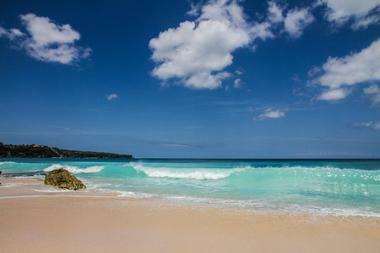 The beach is close to the neighboring Balangan and Impossibles beaches, famous for their world-class reef breaks. Located on the western side of the island's narrow peninsula minutes away from the Tuban International Airport, Kuta is Bali's most famous destination. 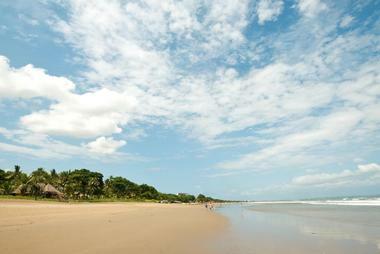 The wide and long white sandy beach extends way beyond the airport into Jimbaran. It is considered Bali’s best sunset site, so every late afternoon hundreds of people come to one of many beachside cafes to enjoy spectacular sunsets while sampling fresh seafood and cool drinks. The beach is usually packed with tourists from all over the world, and the local massage ladies and hawkers of all sorts of goodies are doing brisk business. 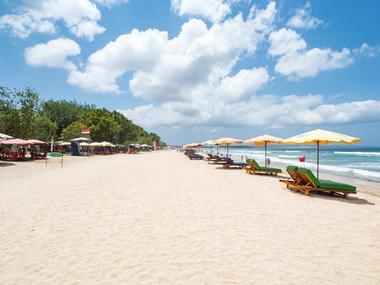 Legian beach is a massive, wide sandy beach in the town of Legian in South Bali. It is lined up with luxury hotels, bars, and cafes. The beach is known for its incredible sunset views and large surfable waves. While Legian is less crowded, more relaxed, and less frantic than Kuta, it is still a party town, attracting thousands of tourists that party at night and spend the day on the beach. The beach is often crowded but its northern part on the border with Seminyak is more tranquil, fringed with greenery and less busy. The part of the beach called Jalan Padma has a great, less crowded surf break. There is a paved trail between the beach and the beachfront hotels that is car-free and great for long strolls along the beach. 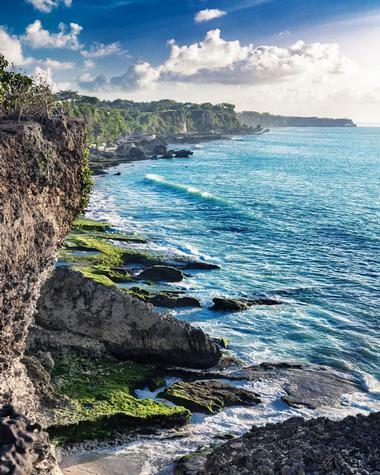 Located on the north-western side of Bali’s Bukit Peninsula and only a short drive from the Anantara Bali Uluwatu, Padang Padang Beach, called Pantai Labuan Sait by the locals, is one of the most famous surf beaches in Bali. The beach is spectacular, with one hundred meters of fine white sand overlooked by an almost vertical cliff. The beach is accessible by a steep flight of stairs that run through a narrow rock entrance. During good surfing weather, the surf is a continuous set of barrels, attracting surfers from all over the world. The beach is part of a chain of world-class surf beaches on the coast of the southern peninsula. Padang Padang is the location of the Rip Curl Cup Padang Padang, an international surfing competition. The Pasir Putih Beach is a pristine white sandy beach almost 400 meters wide, fringed by tall waving palms trees and a few bamboo warungs scattered around. The beach is located in East Bali just off the main road in the quaint village of Perasi. The magnificent beach is very popular, and thousands of tourists come to Pasir Putih Beach every year to stretch on the sand and soak up the sun. The allure of Pasir Putih is in its scenic, serene setting and much calmer waves than on the popular shores to its west. There are massive boulders emerging from the sand near the cliffs. 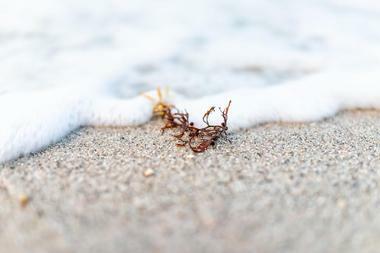 The sand, which is mostly white, has curious black streaks. The beach is lined with a large number of locally owned and run restaurants, bars, and cafes. The visitors have many affordable lodging options. 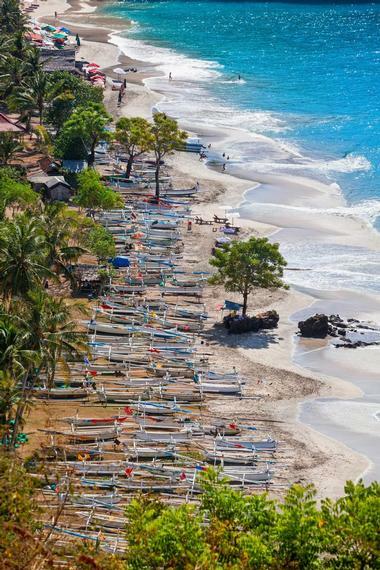 Pemuteran is a small, quiet fishing village on the coast of West Bali. Far away from Bali’s famous tourist spots, Pemuteran is perfect for lazy days on its beautiful white sand beach fringed by trees providing pleasant shade. Considered to be Bali’s best diving destination, the village is famous for its spectacular diving and snorkeling. Since most visitors spend their time under water, the beach is rarely crowded. The sea is perfect for swimming, and with a pair of goggles and fins, you can explore one of the Bali’s most famous artificial Bio-Rock reefs. The coral grows very close to the beach, so to get into the water for swimming, you might have to wait for high tide. 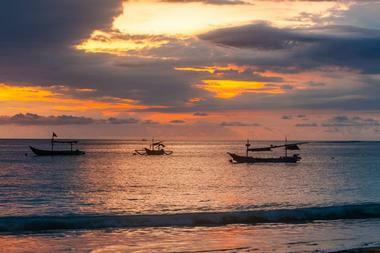 Sanur is one of Bali's oldest beach resort towns, a pretty spot with a pleasant coastal vibe. It is located on the eastern side of the island's peninsula and it is the opposite of Kuta in many ways. The town has a beautiful long beach along the shallow, clear water, and it is very picturesque with colorful traditional fishing boats scattered in the sand. There is a paved cycling and hiking path at the edge of the beach. Just next to the beach is the Pura Blanjong temple made of coral, build in 10th century. In spite of years of tourism development, Sanur retained its quaint charm and the tourists, especially from Europe, keep returning to it. Seminyak is Bali’s famous upscale beach resort area. While exotic and colorful, the town is full of world-class designer boutiques, celebrated restaurants and cool nightlife spots that attract well-heeled tourists. 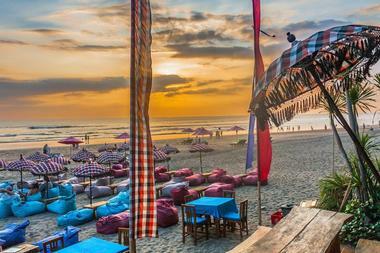 Seminyak also has some of Bali’s most glorious beaches. Five kilometers long, wide, and with smooth gray sand, Seminyak beaches are lined with luxury resorts and hotels as well as upscale restaurants. It is the place to see and be seen – everyone is fashionable and stylish, and it is definitively not for budget travellers and backpackers. Visitors watch spectacular sunsets from the beachfront of the Potato Head Beach Club or from the rooftop of one of the city’s most fashionable bars. The undercurrents are strong, so swimming is risky and surfing is best left to advanced surfers. A wide expanse of sand is perfect for horseback riding, and there are often colorful religious ceremonies conducted on the sand. Suluban Beach is one of Bali’s hidden jewels, a small sandy beach at the end of Jalan Mamo, in the coastal area of Labuan Sait, facing incredibly clear emerald waters. The beach is hidden by fascinating natural limestone formations. It can be accessed by climbing down steep steps and through narrow gaps in the rock. A looming cliff face surrounds the beach. While this does not make the beach very attractive to sunbathers, pro surfers love it, using it as a starting point from which to paddle out to the famous reef breaks. The beach is lined by a row of local cafés, surfboard rentals, and art shops. As you walk along the beach, there are many rocky openings and small caves worth exploring. 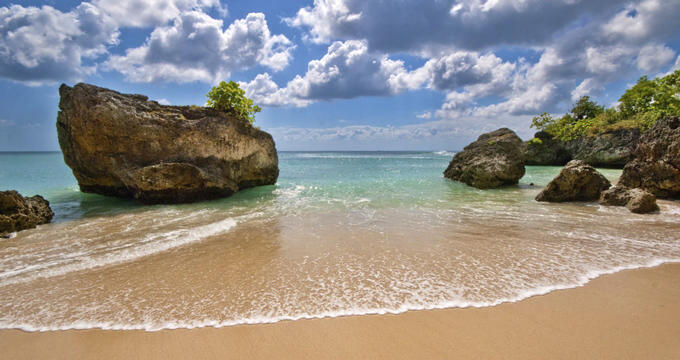 Located on the western edge of the southern Bukit Peninsula, Tegal Wangi Beach is one of Bali’s hidden treasures. The beach is not well known but it is easily accessible. 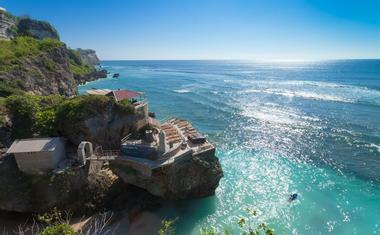 It got its name from the temple that sits on top of the limestone cliff overlooking the beach. Tegal Wangi Beach offers spectacular seascapes with low tides and magical sunsets. There is a seaweed-covered rocky barrier that creates the foreground of the full ocean views. The beach is so picturesque that wedding photographers used to keep it secret and empty of tourists. Swimming on the beach is not recommended because of the rocky bottom, strong undercurrents, and absence of lifeguards. Yeh Gangga beach is one of the very few Bali beaches that can be considered “secret.” Located about 12 km west of Tanah Lot, Tabanan, Yeh Gangga Beach offers a beautiful sunset view and interesting volcanic black sand, but it is too dangerous for swimming and inexperienced surfers. On one end, the beach is surrounded by bright green rice fields, providing an interesting contrast to the dark sands. While the beach is not well known among tourists, it is very popular with locals and it gets crowded in the afternoons. There is often a game of soccer going on across the sand. Experienced surfers and pros love this beach with its left and right direction of waves that are fast and powerful. The strong current takes them far from the shore.